2 Istanbul University, Department of Fisheries Technology, Faculty of Fisheries, Ordu st. No: 8, 34134 Laleli-Fatih, Istanbul, Turkey DOI : 10.4194/1303-2712-v17_6_07 Viewed : 1326 - Downloaded : 1579 Trace metals in red mullet (Mullus barbatus), whiting (Merlangius merlangus) and turbot (Psetta maxima), from the Southwest Black Sea were determined and compared with the permitted limits. 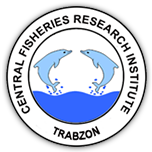 The maximum and minimum concentrations (mg.kg-1) in red mullet, whiting and turbot samples were found as 1.36-11.85, 1.57-3.35 and 0.39-26.36 for Cu; 20.80-34.94, 13.70-36.49 and 4.89-72.13 for Zn; 3.37-5.87, 1.98-7.53 and 0.70-2.90 for As; 0.02-0.05, 0.01-0.04 and 0.00-0.05 for Cd; 0.01-0.03, 0.01-0.02 and 0.00-0.02 for Hg; 0.03-1.70, 0.05-1.22 and 0.00-1.44 for Pb, respectively. The 2% of turbots exceeded the permitted limit for Cu, while 4% of them contained Zn above the limit. Lead concentration exceeded the permitted limit in the 25% of red mullets, 33% of whitings and 15% of turbots. The estimated weekly intakes (EWI) of metals were lower than established provisional tolerable weekly intakes (PTWI).